Discussion in 'Sesame Street' started by Phillip, Dec 17, 2011. 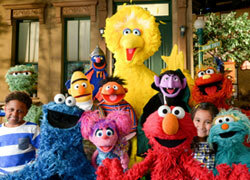 Watch all the free Sesame Street videos now available to download. 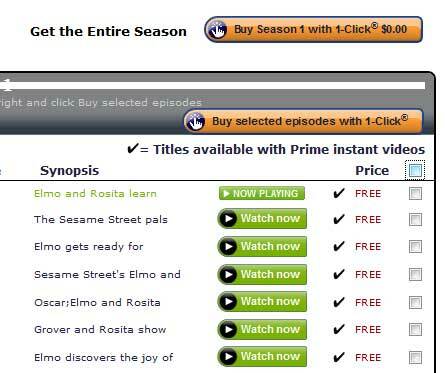 In the "Learn Along with Sesame" series there are 10 full-length episodes to choose from. There are also six free episodes in the "Families Watch Together" series. 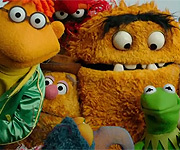 Thirteen episodes are in the "Sesame Street From Around the World" series. Download them all today and let us know your thoughts. Can someone more technically bent help me? I downloaded one of the "Learn Along with Sesame" shows, one of the "Families Watch Together" series and one of the "Sesame Street From Around the World" videos. Is that what there is? Or can we get more than one choice of each series? I clicked each link and it took me to one download. After that, I don't know what to do to get the others. Or do we only get one of each of the three series? Could someone help me today before the offer goes away? You can post here or "Conversation" me. When you go to any of the three pages linked above, underneath the video you'll see something that looks like this. You can either click on the "Get the entire season" link to download all the free Sesame Street videos on that page or click on the check boxes on the right to download the ones you want. If you want all the free Sesame videos, you'll need to do this for each of three series: "Learn Along with Sesame", "Families Watch Together" and "Sesame Street From Around the World". Let us know if you need further help and what you think of the episodes after you watch them. Oh--thank you! That helped a lot! My child is addicted to sesame street and I'm trying to find more episodes for him to watch as they are helping him alaone so much. When I have followed the link to download the free episodes it say's I can't it is ristricted to the US. Why are they not available to us here or if they are how do we get them please? Hi, and welcome to Muppet Central! I also live in the UK, and sadly haven't been able to find a way to download the free Sesame Street episodes from Amazon.com. The nearest I got was using a proxy server called UltraSurf. With that I could watch previews of videos on Amazon Instant Video, which I couldn't do before, but I couldn't download the full videos, and I couldn't see a way of watching full episodes online. Oh well, I guess I'll have to put up with buying DVDs. We do happen to have a few of them built up but money is tight at the mo and I'd love to be able to complete the collection for him. bless him he loves them. As they are free, I wonder if someone on here from the USA could somehow get the episodes to us members not in the USA? Or would that not be allowed? Took the words out of my mouth Panman! If it is actually possible for someone who has ownership to do a digital tape trade or some such thing via seeding a torrent by private tracker or uploading to a file sharing site encrypted, so they're small scale and don't snowball toward mass piracy (Don't hold me on a technicality there) it'd be doing many of us foreign fans a major favour in this regard. I've just been looking around online and have found some out that 'Amazon Instant Video' files have DRM (Digital rights management), meaning that (in Amazon's case) the videos can only be "download to 2 locations". There is legal software to remove DRM, but they all cost money (most are about $35). you don’t need to upload the torrent to a website or a tracker. This means you control who gets the file and who doesn’t, and it won’t be visible to others! I've just had another idea! I wonder if it would work if I used a proxy server and an US account (with an US address)? I'll give it a go tonight with the address of elderly friends (of my parents) that live in the US, and let you know if it works. I would ask them to download them for me, but I don't think they would know how. If it does work I'll buy a DRM remover, and upload it to a torrent file for all the fans not in the US. I don't see anything wrong in that as it's free in the US, and if we all lived there we all would have downloaded them by now. It sort of worked! Well, sort of. The great news is that (with a proxy server and an US account) I was able to 'buy' the episodes, and can now watch them online. But, I can't see a button to download them to my computer. Could someone from the US please confirm that there is a download button, and tell me where it is. No need to reply. I think I have worked it out. I have to download the "Unbox Video Player", before I can download the videos! Ok...I give up. Even with "Unbox Video Player" it won't let me download them, but I can watch them. Thanks. I didn't know they had them on there. Thanks for all your help and efforts with this issue. Its such a shame it wont work. Wow, this is great! I'm going to burn these on to DVDs for car rides with the little guy. Have you tried looking at the source code for the embedded file w/in the amazon video player? You might be able to find a direct link to the video and download it straight from the server, so you no longer have to watch it online. Wow! That's a great idea. I'll give that a go at some point.